We have a wide selection of cask ales, an affordable but quality selection of new and old world wines and freshly produced delicious food to suit everyone; from grandparents to toddlers; we can feed them all. We know that watching sport in your local is important, Rugby, F1, Golf, athletics and of course the footy. 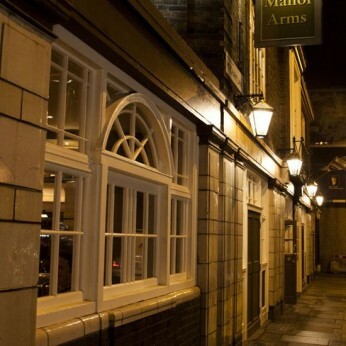 At The Manor Arms you can enjoy watching the game while eating great fresh food in a comfortable friendly environment. Keep your eye on the ball while keeping your eye on your family.